The Hastings District Council should at tomorrow’s (Thurs, March 28) council meeting reject a proposal to include voting tribal appointees on its four standing committees. By allowing appointees to vote on standing committees only, the proposal circumvents the requirement of Section 41 of the Local Government Act 2002 that only elected representatives may vote at full council meetings. The proposal also circumvents the requirement for a referendum because a referendum is only required if the proposal is for a Maori ward. Yesterday’s media release claims the move would boost “Maori participation on all matters facing our community” but does not say that Hastings already has substantial Maori participation by way of its three councillors with Maori ancestry. The council’s push to add voting appointees from four tribal groups is like adding four voting appointees from four family groups, which looks absurd and is a departure from our basic democratic arrangements. The council’s media release loosely describes the proposed voting tribal appointees as “tangata whenua representatives” without specifying the tribal groups represented. The move gives the appearance of a weak council being pressured by vested interests. Councillors should put democracy before political correctness and dump the proposal for voting tribal appointees. 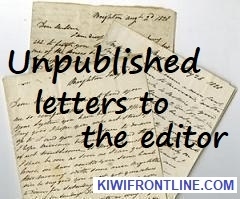 More to the point what does Gary A Clover (letters 22/3/19) think Rangioawhia or Parihaka was? For his information, Parihaka was the reclaiming of government land from a group of rebel Maori who had squatted on it for 14years, and was reclaimed without loss of life. Ranigioawhia was another brilliant and humane action and was the beginning of the end of tribal rebellion in the Waikato, also carried out with minimum loss of life. This Kingitanga movement (a treaty breach) had planned an attack on the citizens of Auckland - “I shall spare neither unarmed people nor property” a letter reveals. Clover’s accusation of fairminded New Zealander’s having ideological predilections of the Treaty of Waitangi is laughable when the likes of Dame Ann Salmond appear to believe that Ngapuhi never ceded sovereignty, yet Article One (Maori language treaty) which many notable Ngapuhi chiefs signed clearly states ceding sovereignty. Lastly, I challenge Mr Clover to point to the word/s or clause/s in the ToW that even imply ‘collective political rights’. It is a shame that Mr. Heperi Smith (Editorial 14/3/19) was not sincerely ‘gracious’ and showed genuine ‘understanding’ at the Otane public meeting by addressing the attendees in New Zealand’s common everyday language, English. The long suffering public were in fact the gracious understanding ones by not walking out of the meeting. In a nutshell, the reo zealots rudely push their agenda by arrogant grandstanding to captive audiences. I, and in my opinion the majority of New Zealanders believe New Zealand ‘grew up’ in 1840, however there is an element in our society that want to hark back to the stone age days of inked faces and prattling in a neo fabricated language. This aberration survives only on taxpayer life support and through coercion in the workplace to learn something that is off no use outside NZ. Re article in the Whanganui Chronicle 23rd Feb, ‘uneasy about our day of celebrations’. I have never read such rubbish as the one written by Dani Lebo. If she is an American she should go back home to her own country, she just doesn’t know anything about our true history of New Zealand. 1st She says we are colonisers living on indigenous land. For a starter Maori are not indigenous to New Zealand. There were other people here before they arrived , even our history and Maori tells us. Some of the people living here before the Maori were Ngati Kahupungapunga, Waitaha, Turehu,Patupaiarere, Ngati Hotu(Celts) Chinese who were all caucasion /fair skinned people except the Moriori who were darker skinned..
2nd Maori are not Tangata Whenua, which means ‘the ancient ones’ or ‘the people before us, until Maori change it to mean themselves. 3rd Dani mentions about our colonial history, what about our pre maori history like the Celt village in the Waipoua forest takes it about 3000 years old covering 600 acres. Koro Pa in New Plymouth built a 1000 years be fore Maori. There also were a miniature Stonehenge with blocks standing six to seven feet above the ground at Kerikeri. and another north of Taupo consisting of fifty great stones. Dani mentions about celebrating Maori culture, what about Celtic culture. 4th wrong New Zealand has never been called Aotearoa, Maoris never used that word. If the paper uses you as their new columnist I pity the paper, get your facts right. Don’t you dare Mayor King! I would be fairly confident that Mr. Maipi’s version of events at Rangiaowhia and Parihaka would be at variance to the accounts of many respected and well researched Historians. While Mr. Maipi highlighted three individuals whose names he wants expunged for “murdering Maori” has he forgotten under whose instructions they were operating? Given his reasoning shouldn’t Mayor and Council also have in train a move to rename Victoria St? When Mr Maipi vandalised a prominent City statue, without penalty, I suggested he had far too much publicity. I repeat that belief. “It is a peculiar feature in the history of Taranaki that before the regular settlement of the country by the British, it had for several years been almost deserted by the natives. “The Waikato conquered it in 1830 ... but not considering it worth while to retain occupation, they returned Northward. I can provide missionary Ironside’s full letter from which I have already “cherry-picked”. It is nonsense for Norton to describe the suppression of the rebellions as “invasions” of British sovereign territory. In the first rebellion against the Crown of some Taranaki tribes, in a little over twelve months, the rebels destroyed 177 settler properties. I have W I Grayling’s detailed 1862 list. Well now that Waitangi Day is over (Dani Lebo 23 January) let’s try facing reality. Assertions (ipse dixit) by treatyists, apologists and part maori activists as is the norm are usually based on creative fabricated myth-history rarely coming anywhere near the truth or facts and exaggerated beyond recognition. February 6th always sees these mistruths trotted out ad nauseum. What’s more the ‘chosen few’ are no more indigenous than all Kiwis born in this country and these souls are not and were never conservationists or environmentalists per se quite the reverse if history and past behavior/practices like destruction of moas and South Island forests are anything to go by. Claiming special race-based privileges aimed to score more of the valuable resources is a travesty. Entitlements claimed are usually to the detriment and cost of all other Kiwis. Non- productive non- contributory parasites would be a good description for this bunch who rabbit on like one tracked cracked records with their invalid PC claptrap. There is no place for race- based activists promoting neo racism nor their fawning toady sycophants a.k.a Awol brain brigade. The proposition that somehow NZ pre-1840 was a Utopian Garden of Eden and has since become Hades is unmitigated arrant nonsense. We have moved on over 200years from stone age New Zealand and even if there was any shred of truth in what is regularly promulgated just get over the fictional Treaty principles and partnership nonsense, get on with life, stop navel gazing and seeking free lunches. Peter Dey (Letters February10) seems to suffer tunnel vision when distinguishing between ‘stolen’ and ‘legally confiscated’ lands, the latter being the consequence of rebelling tribes breaching the Treaty. We can debate the translations of the Tiriti o Waitangi (only the Maori treaty and Littlewood final English draft ) ad nauseum but the facts are the Queen of England, ruler of greatest empire on the planet at that time did not do partnerships, why would she? Especially with a collection of disparate warring tribes/chiefs who had previously begged for protection from primarily the French, secondly from fellow marauding tribes, google Yates letter to King William IV. As Article 3 granted Maori the rights of British subjects it was constitutionally impossible for the Crown to enter into a partnership with it’s subjects. Position is clear sovereignty was ceded, no partnership and no principles. Re Dominion Post February 2nd Petition ‘Should we be Aotearoa’ Why do we need two names for our country. Who is wanting to change the name of New Zealand and include Aotearoa. In the treaty New Zealand was called Nu-Tirani in 1840. It was Turi as navigator of the Aotea who brought the Moriori to New Zealand over 300 years before the Maori. It was the Moriori who used the name Aotea after their craft landed meaning ‘The Dawn’ or ‘Where we have landed’. About 1890 a couple of Europeans writers use it as a fanciful name for New Zealand. Aotea is not a Maori name, The reason behind adding Aotearoa to it is that further down the track the word New Zealand will be removed. Potonga (alias Gary) Neilson (Chronicle, 15/2/19) may be right that there are some old kumara pits along the Taranaki coast but that is about all he says before drifting into fantasy. As recorded by missionary Samuel Ironside who, unlike Potonga, lived in Taranaki in the 1850s: “They have now millions of acres of land unappropriated, not one tithe of which they can ever cultivate. This land has been a fruitful source of quarrel, bloodshed and violence.” And violence there certainly was. Has Potonga forgotten the capture of Pukerangiora pa, just a few years before 1840 when about 1300 defenders were killed and eaten by invaders from Waikato, an event which led to the virtual depopulation of the whole of south Taranaki. It is that sort of behaviour which “decimated the native population of this land” (to use his terminology), not any actions of the presumed wicked white colonials. Read John Robinson’s careful demographic analysis in “When two cultures meet” (Tross, 2012) if you doubt it – a vastly superior source of information to Potonga’s wild speculation. I have three questions: 1: What are the principles of, and 2: What is the partnership pertaining to the Treaty of Waitangi (how can we have a partnership if we are one people? ), and 3: What percentage of Maori have benefitted from the billions of dollars (and counting) which have been handed out by the New Zealand taxpayer to them to date? The treaty gave Maori people British citizenship, and saved them from harsh treatment from the most warlike among them (no need to go into explicit detail). It may be said that many, if not most, Maori were not warlike, but simply wanted to live in peace, as they do today. I challenge the Governor-General, Prime Minister, Parliamentarians, Historians, University Lecturers, Media Journalists, and anybody else to front up with definite answers. But I won’t hold my breath! What percentage of Maori blood do they have in their veins? One leader has 1/16th Maori and the rest is, of course, 15/16ths “Pakeha”! One person in his tribe has 1/256th! One prime minister, when asked what constitutes a Maori, answered that “if you think you are Maori, you are Maori”. Another said that he would do something about the situation but, on becoming PM, did not want hokois from hell! I understand that there some 4000 sites in New Zealand that may well prove that there were people here before the arrival of Maori, including a dormitory some 72 feet by 12 feet in Akaroa Harbour. It’s time to dig some of them up and put our true history to the test. In response to Hinemoa Elder 28.1.19, What is this Woman on? She needs to weed out her own racist lies, the so called Colonials have built all the infrastructure and comforts she enjoys in this country. She infers lateral violence Maori beating up Maori is because of the Colonials? Maori were committing horrific atrocities to each other long before the English landed here! Who are the majority now committing violence on woman and children, stop trying to blame others and start taking some responsibility for yourselves for a change. Also in the Treaty of Waitangi the Chiefs did cede Sovereignty to Queen Victoria [another lie saying they didn’t], since when would a Queen of Britain ever form a partnership with a handful of natives only, excuse me! 1860 at Kohimarama, 20 years on after the Treaty, where the meeting of many of the Chiefs who had signed, gathered to say they were happy with the Treaty and fully understood Queen Victoria’s Sovereignty over them and all the people of NZ. The Chiefs were well versed, the Missionaries had taught many English well and about God and it could be said they had a better understanding than you Ms Elder! Only one legitimate Treaty namely TeTiriti o Waitangi maori language version with a Preamble and 3 Articles a benign document all Kiwis could live with plus one genuine final Hobson/Busby English language draft (aka Littlewood draft) which cross-translates perfectly with the signed TeTiriti whereas the bogus/false Freeman version doesn’t. No signed EnglishTreaty and Hobson stated Treaty signed at Waitangi on 6 February1840 was the only Treaty. Translating one page /500 words into 30 languages is nonsense. Once Treaty was signed, almost immediately redundant as Sovereignty ceded by chiefs who signed, British Citizenship granted and maori land sale rules all in place so 3 Articles were satisfied with the coup de grace being absolutely no reference to any Treaty Principles, Partnership nor Fisheries, Forests, Rivers, etc. in either TeTiriti or Littlewood draft!. The Treaty promised only what was contained in the 3Articles. In fact wasn’t a treaty as not made between nations but simply an agreement between the Crown and a group of disparate warring maori tribes represented by 52 chiefs at Waitangi with eventually 542 signatories all ceding sovereignty. However, in reality sovereignty was acquired by the Acts of State (May1840) confirmed by QueenVictoria’s Royal Charter of 16 November1840. In reply to W. Shaw letter January 18th in our history book it reads Beside gods, the natives believed in the existence of other beings who lived in communities, built pas, and were occupied with similar pursuits to those of men. These were called Patu-paearehe the chief residence were on the tops of lofty hills and they are said to have been the spiritual occupants of the country prior to the arrival of Maori. The Wanganui natives state that when they first came to reside on the banks of the river, almost all the chief heights were occupied by the Patu-paearehe. The patu-paearehe were only seen early in the morning, and are represented as being white, and clothed in white garments of the same form and texture as their own; in fact they may be called ‘the children of the mist”. They are supposed to be of large size and may be regarded as giants. They are seldom seen alone, but general in large numbers; they are loud speakers and delight in playing on the putorino (flute). They are said to nurse their children in their arms the same as Europeans and not to carry them in the Maori style, on the back or hips. If you look at a $1.20 stamp you will see on it a Patupairehe, there are descendant of the Patupairehe still remaining here with golden hair and green eyes of the ancestors. In response to the pack attack on A N Christie (letters 9/1/18). Jackie Evans - agreed te reo is an official language of New Zealand, but it is not the COMMON language and I doubt that te reo will ever be the common language of New Zealand. Noel Jory - ‘first language of Aotearoa’. Aotearoa is a mythical name for our country, secondly please produce a written pre European document in what you call the ‘first language’. Even the ToW was first drafted in English and then translated into Maori. Maori language was prohibited in schools at the request of the Maori elders of the time, all children of those times were physically punished for misdemeanours, not just Maoris. Ruth Thomas – English is not a legislated official language of New Zealand. Further those that push the ‘te reo needs to be normalised....’ barrow do not realise how sinister normalising te reo is. It is key to enable the Maori sovereignty movement to impose their self-serving agenda (tribalism and control) onto New Zealand. I wonder if this is what the majority of New Zealanders really want? S White ( Post, 7/1/19) refers to Te Reo as our "indigenous language". It is not for the simple reason that Maoris are not indigenous, despite what the ignorant UN said. Maoris arrived at a more-or-less accurately known time only a few centuries ago, which disqualifies them from being indigenous, and proceeded to slaughter our truly indigenous people, very few of whom survive today. Recently you printed a letter of mine pointing out that as the Stone Age Maori culture had no writing, books or libraries, it was fatuous for the City Council to give its new Library a Maori name. You printed a response from K Gillard making the absurd claim that as there had been a Stone Age in Europe, my comments were groundless. She seems unaware that European civilization has progressed a long way from the Stone Age in ways too numerous to mention. There followed a letter from G Mitten, saying much the same - did they collude? - and suggesting that as I reside in Nelson it was not my business. Well, Christchurch is my birthplace, with associations for seven generations of my family. Can any ex-Rarotongan newbie say anything to compare? Gerry Mitten ('Press", 1/1/19) "wonders why", living in Nelson, I have any interest in Christchurch affairs. Let me inform him. Christchurch is my birthplace; my parents and paternal grandparents all lived and died there. It was my home for 56 years; I brought up a family there and three of them and my late wife graduated from Canterbury University. I was critically injured in the 2011 earthquake and evacuated to Nelson by Life Flight aircraft three weeks later when it was safe to do so.